Chayote is known by different names in different cultures. In the USA, it is commonly called mirliton or pear squash, choko in Australia, chuchu in Brazil, sayote in the Philippines, pipinola in Hawaii and tayota in Dominican Republic. Despite its different names in several languages, chayote (scientific name: Sechium edule) is known to be one of the most nutrient-rich foods globally. The plant belongs to the gourd family and it can easily be recognized by its green color. The unique appearance of this gourd is that on the opposite end of the stem, it looks like an old person’s mouth without dentures! When cut open, there is only one soft seed inside. Overall, chayote actually looks like a green pear with coarse skin. Looks can be deceiving because it might not look appealing but this gourd has a lot to offer. Anti-cancer: Chayote is rich in vitamin C which is an effective antioxidant which is essential to protect our cells from free radical causing cancer. Based on research, it provides at least 17% (RDI). Blood pressure: Drinking chayote juice regularly helps to bring down blood pressure effectively. Bone strength: The excellent source of vitamin K and all the right nutrients in this gourd help to strengthen bone and teeth structure. Brain health: Getting forgetful lately? Add chayote in your juices daily to improve brain health. Chayote contains the necessary nutrients that help to enhance memory and brain function. 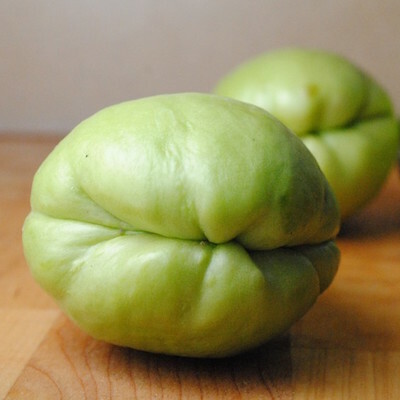 Constipation: Chayote is rich in fiber which aids our metabolism and promotes healthy bowel movement. Heart health: Chayote is rich in B vitamin folate that helps prevent homocysteine build-up. Homocysteine is one factor that poses threat and risk of heart disease and stroke. Leg cramps: Leg cramps are such a nuisance but this also means that you lack magnesium and potassium. Chayote is an excellent source of these minerals and eating chayote on a regular basis can help reduce your leg cramps. 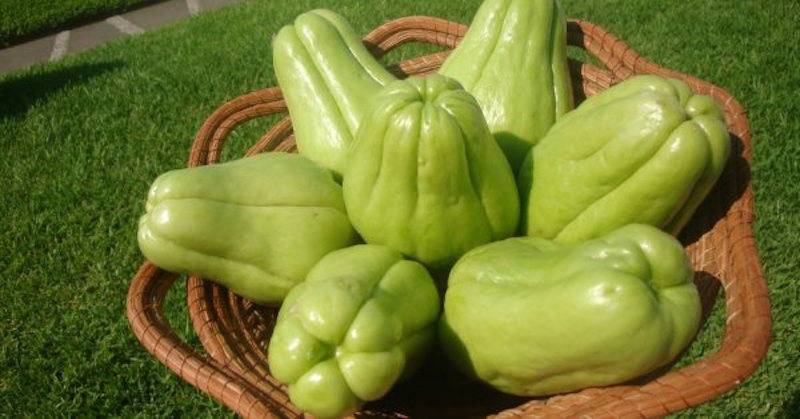 Respiratory health: Chayote is soothing to the respiratory and lung health, making it beneficial for relieving cough, cold, phlegm or other respiratory issues. Best way for using it for this purpose is to make it in soup or stew. Skin health: Because of its zinc content, eating chayote helps to prevent acne and give you clear-looking skin. Zinc is the nutrient that controls our hormones to balance the oil on our skin. Thyroid gland health: We all know that iodine helps keep our thyroid gland in good shape, but combining it with copper will boost its efficacy. This gourd has it all. Weight loss: If you are on a diet and thinking about hitting the gym to lose weight, then you should include chayote in your juice and meals because of its manganese content. Manganese is an essential nutrient that helps our body convert protein and fat into energy. Try a natural juice with chayote instead of chemically-filled energy booster drink and feel the difference with your energy throughout the day. When it comes to flavor, chayote or pear squash has a mild taste. It can either be eaten raw in which they are shredded and included in salads. In other countries, they are cooked in stews, soups or even slow roasted. I use it mainly in my juices. The taste is bland so it mixes very well with almost any fruits and vegetables. When preparing chayote, you will see that the skin may give off a latex-like substance which could cause an unusual tingling sensation in some people when it comes in contact with the skin. However, this does not have any long-lasting effect and there is nothing to worry about. It’s great for women who are breastfeeding. It helps with breast milk production. This gourd is called Christophene in Barbados. Not such a fan but now I will be. It can be eaten raw with lime and salt pickle. I am just now beginningto look into eating more strange fruits and veggies … I call them strange because I have never tried them. Growing up in the inner city of Chicago, if they had such a thing I sure didn’t know about it. I have now, as a 54 year old woman, been suffering since 2009 with diabetes. I’ve seen my mom died from cancer three years ago. My late husband also 4 years ago from cancer, then a favorite uncle from cancer. Then, just before father’s day I lost my dad who suffered for over 10 years with dementia before he passed away. I got tired of losing loved ones to curable diseases as well as suffering myself with diabetes, hypertension and now cholesterol. After adding more problems to the list of health issues I started thinking, God, there has to be a better way. So now I am searching and reading. I have found that a local Spanish grocery store sells all sorts of tropical fruits and vegetables that are new to me and I have never tried. I long to try the Chayote, the whole papaya fruit itself as well as Nepal cactus and much much more as I learn. In hopes that one of these will aid in helping me reserve this monster in my eating habits I have created. I will try to keep you posted with my progress, if there be any. I’ve been eating chayote squash since I was a kid. My mom cooked them in oil, onion, and black pepper delicious. I cook them to this day the same way and eat them raw and juice them. Thank you for this helpful information. I had never heard of chayote until I saw it in the grocery store yesterday. I was curious, so I bought it and roasted it with olive oil and garlic. It was very good! I’m hoping it will benefit my health as well.